Adolf Kloke-Lesch (SDSN Germany): Why is the EU Failing to Champion the SDGs? The European Union is truly at a crossroads. Populist movements and parties are questioning its value for Europeans, while the United Kingdom is set to leave the EU in March 2019. Threats to the rules-based world order and tectonic shifts in geopolitics challenge allegedly immutable truths and long-term partnerships. Meanwhile, a new European Parliament will be elected in May 2019, to be followed by a new composition of the European Commission. The debate has already started on the next EU budget, called the Multiannual Financial Framework, which will set the EU’s financial and political priorities until the end of the next decade. While controversies between governments drag on—not only on the subject of refugee policy—there definitely is a lack of a common positive vision of the EU’s future that would resonate with its citizens. We see an eternal recurrence of the same, so to speak: stereotypical debates about more or less Europe, widening versus deepening, solidarity and austerity, or voting procedures; these and others all turn hollow if not linked to substantial issues that people care about. It should therefore have come as no surprise that the EU became an early champion of designing what became the UN 2030 Agenda for Sustainable Development that was adopted unanimously by world leaders at a special UN summit in September 2015 in New York. Entitled Transforming our World, this “plan of action for people, planet, and prosperity” is an extraordinary achievement in times of global uncertainty and division, as well as an elaborate global affirmation of core European values and aspirations. The 2030 Agenda set 17 Sustainable Development Goals (SDGs) to be met “for all nations and peoples and for all segments of society” (see Box 1): these must necessarily be implemented at local, national, and regional levels—in other words, globally. With all that being said, a fundamental question needs to be asked: are the SDGs, championed by Europeans at the United Nations, becoming the roadmap for the EU itself, across all domestic and international policies? The answer is quite discouraging. At best, it is “not yet,” for the European champions of the SDGs on the world stage are dragging their feet at home and in Brussels. It seems as though the discourse on the future of Europe and that the one on sustainable development inhabit two different planets. The Commission’s White Paper of the Future of Europe (2017) mentions the SDGs only when praising the achievements of EU diplomacy; there is no consideration of whether implementing fully the SDGs might have a bearing on Europe’s own future. This reflects the mistaken perception of many political leaders that the SDGs are something to be dealt with under the category of development aid or environment protection. They have not yet realized that some of the EU’s most pressing socioeconomic priorities and challenges, including rising inequalities, youth unemployment, migration, and climate change, are covered under the SDGs. European Commission President Jean-Claude Juncker is said to have never been approached by a single European leader on the issue of the role of the SDGs in implementing the sustainable development agenda within Europe. Again, it comes as no surprise that we have not seen a statement by the European Council on this topic since the adoption of the UN 2030 Agenda for Sustainable Development. This constitutes a deplorable void of political leadership by the body in which the heads of state or government of the 28 EU member states are meant to shape the future of Europe. This void cannot be compensated for by the many assiduous efforts within parts of the Commission and some working parties of the Council of the EU that have delivered several communications and conclusions on the 2030 Agenda since its 2015 adoption. It must be said, in addition, that the European Parliament and the European Economic and Social Committee, where civil society representatives come together, have raised their voice in favor of embracing the SDGs in and for the EU. Furthermore, during 2018’s European Sustainable Development Week, tens of thousands of European citizens took part in more than 6,000 initiatives in 34 European countries—an increase of 50 percent compared to previous years. The critical question is whether the pre-election campaigns for the European Parliament, scheduled for May 2019, will result in additional momentum to bring the EU back on its path towards the sustainable development of Europe. 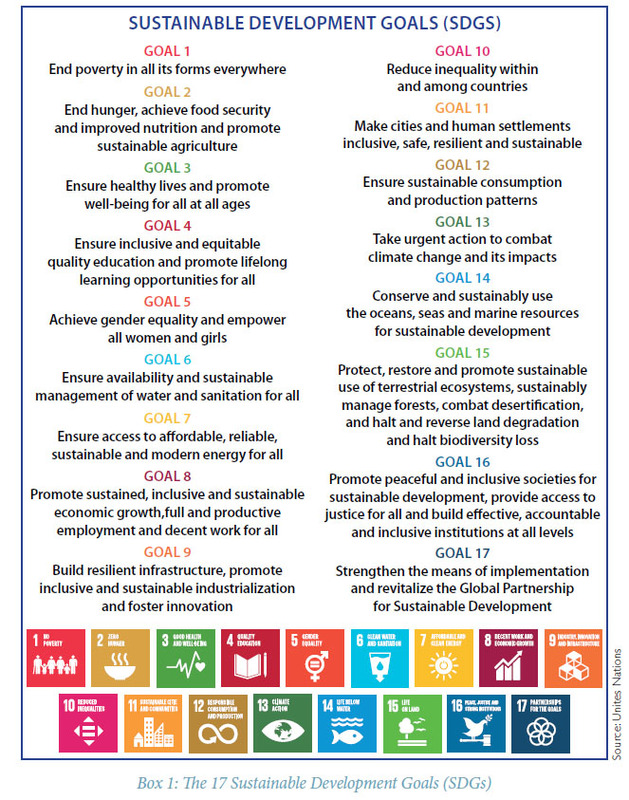 On track with the SDGs? “You cannot manage what you don’t measure.” With these words, Frans Timmermans, the First Vice-President of the European Commission, began his foreword to Eurostat’s publication Sustainable Development in the European Union. He should have added the following: “you cannot manage what you measure without time-bound and quantified targets.” It was on this that the 2001 EU Sustainable Development Strategy (ESDS) was weak, garnering little attention in Brussels. At the end of 2017, Eurostat published the first Monitoring Report on Progress towards the SDGs in an EU Context, with 100 indicators structured along the 17 SDGs. However, EU policy targets do not exist for most of the SDGs, and many of them are set for a time horizon of 2020 and not 2030, as per the 2030 Agenda. Thus, the European Union—the most vocal champion of the SDGs—has not made its priorities and policies compatible with those same SDGs. The EU neither knows which SDG-related indicator targets it has to achieve by 2030 nor the distance it still needs to cover. It remains to be seen whether a gap analysis, which is currently underway within the Commission, can solve this dilemma. 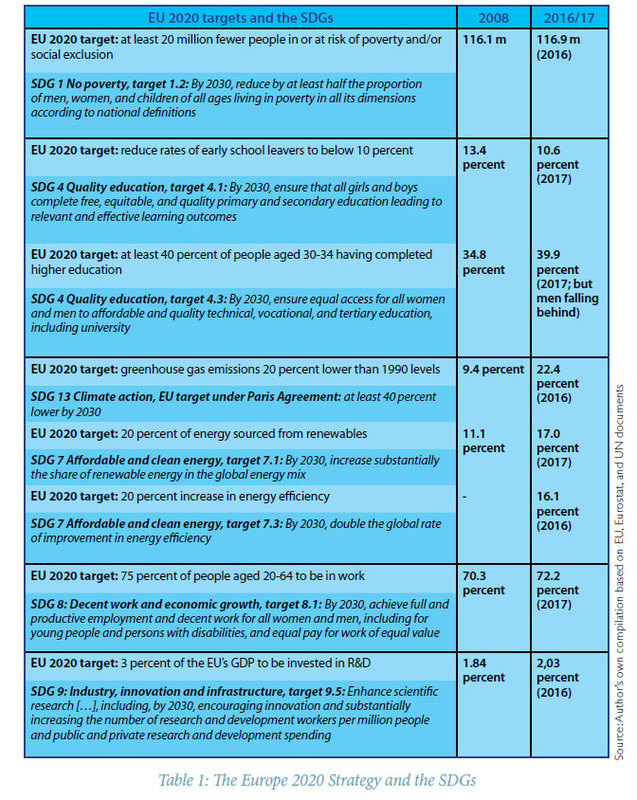 Taking a brief glimpse at the headline targets of the 2020 Strategy and the related SDGs makes manifest the difficulties that lay ahead for the European Union (see Table 1). Even if only set against the self-proclaimed targets, the data show a mixed picture. Trends are insufficient or negative in the social and economic fields, while some positive trends can be seen on climate and energy, as well as education. However, the picture turns bleaker when data is disaggregated by country—i.e. by EU member state. Country-level poverty and education indicators vary by a factor up to two, climate/energy and R&D indicators by up to four across EU member states. Furthermore, the targets set by the EU 2020 Strategy fall short of the ambition of the corresponding SDG targets for 2030. These would, for instance, call to relieve 60 million EU citizens of the risk of poverty and social exclusion over the next decade, or to bring down the share of early school leavers to zero by 2030. The emission of greenhouse gases would have to be reduced twice as fast if the self-set Nationally Determined Contribution (NDC) target under the Paris Climate Agreement (which is part of the SDGs, as defined by the 2030 Agenda) is achieved. These few examples show both the challenges and potential for Europe’s future that come along with embracing the SDGs and respecting planetary boundaries in the climate change context. The difference in score between Sweden and Greece is as big as that between Greece and countries on the last quarter of the list, like Rwanda (120th with a score of 56.1). These scores demonstrate both the scale of the remaining distance to reach even for countries like Sweden, on the one hand, and huge internal challenges in the EU and its member states, on the other. Furthermore, Europe produces significant negative spillover effects. There is a clear indication that the EU is not on track to negate spillover effects, even though data is still limited and difficult to compare. 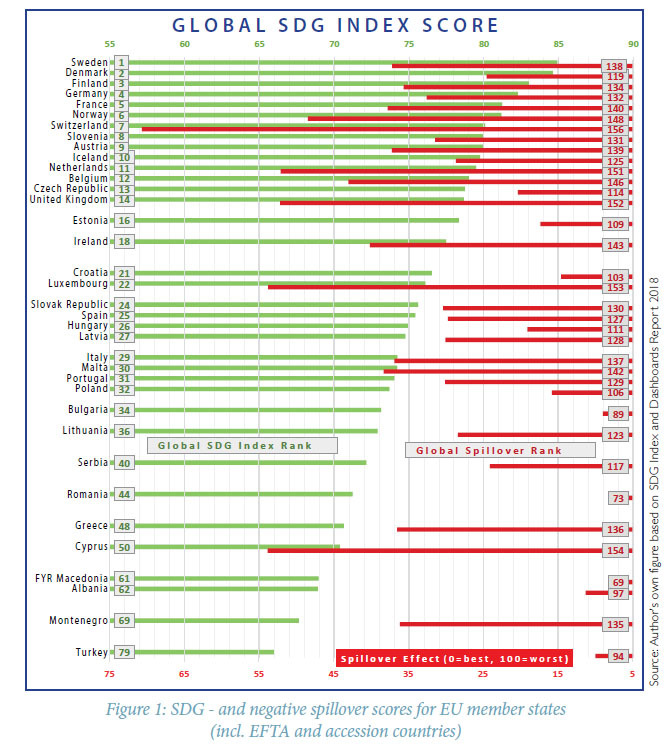 Two-thirds of the 40 countries with the worst negative spillover effects are EU member states, or are linked to it via the European Single Market or their respective candidate status. One should, therefore, not be deceived by high SDG scores that certain EU member states have received for their implementation of the SDGs domestically, for they come with costs for other countries and, ultimately, the planet. If the EU and its member states want to be serious about achieving the SDGs, they need to translate the global SDGs into European and national targets compatible with the global goals set for 2030. When the 2030 Agenda was adopted in New York in 2015, the priorities for the current Commission (2014–2019) had already been set by European Commission President Jean-Claude Juncker as per the terms of his “Agenda for Jobs, Growth, Fairness and Democratic Change.” It was commendable that Juncker entrusted First Vice-President Timmermans with the horizontal responsibility for sustainable development. There have also been laudable but isolated initiatives in areas like the circular economy and sustainable finance. But the fact remains that the UN 2030 Agenda—specifically, the SDGs—largely did not inform the current Commission’s priorities and work programs. As political attention moved to other issues like migration or Brexit, one got the impression that the option of fully embracing the SDGs as a road-map for the EU’s future has been left to the next Commission and the period after the European Parliament election in 2019. Since then, a lot of foundational work for an ambitious action plan could have been done, bolstered by the Multi-stakeholder Platform on the Implementation of the SDGs set up by the Commission and the work of Eurostat. Unfortunately, to date neither a gap analysis nor an implementation strategy has been presented. All that can be expected now is the publication of a Commission Reflection Paper, which will reportedly be entitled Towards a Sustainable Europe by 2030 and published by the end of 2018. Considering such slow progress, it is questionable whether the EU will be able to present an ambitious and concrete first report on the internal and external implementation of the 2030 Agenda by the EU at the United Nations’ High-Level Political Forum (HLPF) in 2019, as per the current schedule. In contrast, 24 EU member states (and 3 candidate countries) are already among the slightly over 100 countries that have presented Voluntary National Reviews (VNR) at the HLPF. Clearly, there are big differences in scope and ambition between these VNRs—with some countries comprehensively translating the SDGs into national goals, including the means of implementation—and others just relating existing policy objectives to some of the SDGs. An optimist would say that there is notable movement at the level of member states upon which the EU can continue to build its efforts. This is crucial, since responsibility for the implementation of the 2030 Agenda lies with states in the first place. The EU should focus on its responsibilities and the added value it can provide. Under its Better Regulation agenda, more specifically with its principles of subsidiarity and proportionality, the Commission wants “to be big on the big issues and small on the small ones,” to quote a recent statement by Juncker. As the SDGs are a big issue, there clearly is a role for the EU in areas of exclusive and shared competencies. But other roles also come to mind, like supporting, coordinating, and supplementing the actions of member states. Acting on the SDGs would also help build cohesion within the EU and could provide frameworks for EU-wide discussions and implementation. To promote the SDGs internally and externally, the EU should use its broad range of policy instruments, like legal acts, budgetary means, and external action initiatives. Furthermore, the EU’s Policy Coherence for Sustainable Development (PCSD) toolbox can ensure that all EU policies contribute to, or at least do not hamper, the achievement of the SDGs. When translating the SDGs into quantified and time-bound EU-wide targets, close attention should be given to areas where EU action is of particular relevance to achieving the SDGs—across both the EU and globally. Existing EU policy targets and strategies should be adapted to match the ambition set by the SDGs. Beginning with the targets, the EU could enhance its strategies on issues such as reducing EU-wide inequalities or decarbonizing energy and other SDG transformations (i.e. agriculture). Similarly, linking competition and industrial policy with digitalization and sustainability could offer significant win-win potential. Three years after the adoption of the 2030 Agenda, the EU must move from reflection to action on the SDGs. 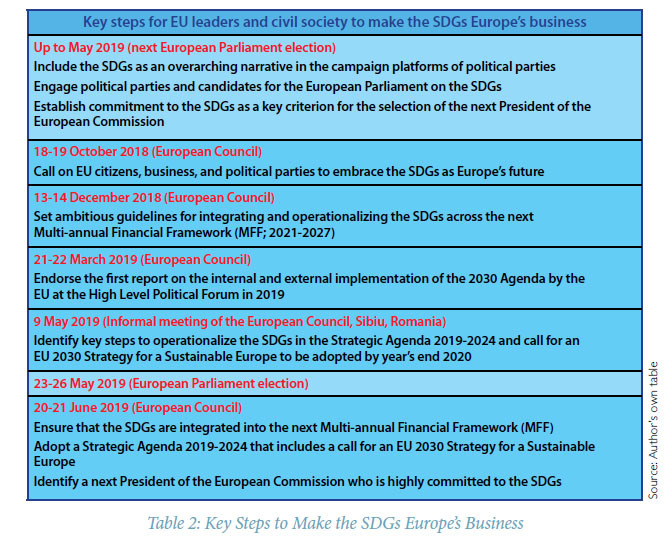 Having lost much time and missed many opportunities, European leaders and Europe’s civil society must now use the few remaining forks in the road to make the SDGs Europe’s business (see table 2). In October 2017, European Council President Donald Tusk presented his Leaders’ Agenda. It rolled out the key topics EU leaders were expected to have to deal with in upcoming meetings of the European Council. So far, the SDGs are not among them. Security, migration, and trade were placed at the top the agenda. Nevertheless, the Leaders’ Agenda is a living document, so there is still plenty of opportunity to rise to the level of the SDGs’ ambition in the time ahead. It is fortunate that the Leaders’ Agenda already includes two topics that are particularly critical to achieving the SDGs in the EU and beyond: the Multiannual Financial Framework 2021–2027 (MFF) and the European Council’s Strategic Agenda 2019–2024. EU leaders should embrace such opportunities and take substantial directional decisions to pave the way for the achievement of the SDGs in and by the EU. In December 2018, they will need to set ambitious guidelines to integrate and operationalize the SDGs across the next MFF. In addition, in March 2019 the European Council could show its commitment by endorsing the first EU report on the internal and external implementation of the 2030 Agenda by the EU, to be presented at the HLPF in July 2019. Lastly, at their informal meeting scheduled to take place in Sibiu, Romania, in May 2019, EU leaders should ensure that the SDGs are given pride of place in their next work program: the Strategic Agenda 2019-2024 (to be adopted by the European Council in June 2019). In particular, the Strategic Agenda should endorse the proposal for an EU 2030 Strategy for a Sustainable Europe. With the next European Parliament election fast approaching, the EU has entered a transitional period that will end only in autumn 2019 with the formation of the next Commission. This period must not lead to further gridlock in the context of implementing the SDGs. Instead, the parliamentary election and ensuing nomination of the next President of the Commission should be used to promote the SDGs as an integral part of the narrative for Europe’s future. It must be underlined that Europe’s leaders who celebrate the universal nature of the 2030 Agenda at international conferences should no longer hesitate to do so boldly at party conferences and on the campaign trail. Civil society should engage political parties and candidates on the SDGs. In particular, fundamental commitment to the SDGs should be established as a key criterion for the selection of the next President of the European Commission. The EU budget is a strong tool to support European policies across its member states and worldwide. Although accounting for only roughly 1 percent of the EU’s GNI—still (too) modest in size—its expenditures amount to 10 percent of overall public spending in many member states. Furthermore, the programs funded by the EU budget set standards and leverage additional funds for these ambitions. In May 2018, the Commission presented its proposal for the next Multi-annual Financial Framework (MFF) covering the years 2021–2027. Answering whether the proposed sum of €1.2 trillion will work as a powerful catalyst towards the SDGs will significantly affect the fate of the SDGs in Europe and beyond. Unfortunately, it appears that the Commission has shied away from this opportunity. Although the proposal invokes prosperity, sustainability, solidarity, and security as its guiding principles, the draft’s language on the SDGs seems to have been deliberately toned down. It is fine to state that the investments lined out in the MFF ought to “hold the key to Europe’s future prosperity and its leadership on the global Sustainable Development Goals.” But unless both objectives are linked to each other and subsequently broken down by the individual programs, the rhetoric will ring hollow in practice. Indeed, simply using the word “sustainability” multiple times on many pages does not meet the ambition of the SDGs. It is only in a footnote that the MFF proposal refers to the Reflection Paper “Towards a Sustainable Europe by 2030” that needs to be adopted by the Commission at the end of 2018. This footnote does not even indicate any process of how the findings could be integrated into the MFF. The Commission would be well advised to present its Reflection Paper well before December 2018, when the European Council is due to discuss progress achieved on the MFF. It would make a huge difference if, for instance, the European Regional Development and the Cohesion Funds (€242 billion proposed for 2021-2017), the European Social Fund (€90 billion), and the Agricultural and Rural Development Funds (€324 billion) were used for the achievement of the SDGs in all EU member states. This could also help the many bottom-up SDG initiatives at regional and city levels and promote the SDGs among EU citizens as a guiding constellation for Europe’s future. Balkan candidate states have embraced the SDGs and accession to the EU as mutually reinforcing agendas. Pursuing the 2030 Agenda interacts both with the EU integration process and regional cooperation. Regrettably, it also became clear during the side event that the EU has in no way linked its Western Balkan enlargement policy to the 2030 Agenda. The recent April 2018 Communication on the EU Enlargement Policy does not even mention the SDGs. While the SDGs should not dilute the EU’s acquis under the many chapters of accession negotiations, it should be evident that the SDGs themselves are becoming part of the EU’s acquis, raising the ambitions of both member states and candidate countries. Looking at the chapters through the lens of the SDGs could help identify areas that need more attention, mobilize societal support, and link the accession process to citizens’ daily concerns. Under the next MFF, a total of €12.8 billion is proposed for the Instrument for Pre-Accession Assistance. It should be designed to assist candidate countries and potential candidates in linking their paths to both fulfillment of the accession criteria and achievement of the SDGs. This should be even more self-evident as these states (still classified as developing countries) have a special track-record on translating the Millennium Development Goals (MDGs) into national strategies that they are now building on while pursuing the SDGs. Perhaps the SDGs will prove to be a two-way-bridge between the EU and the candidates—something from which the EU and its actual member states can draw adequate lessons. Accounting for six percent of the global population and 22 percent of global GDP, the EU is the world’s second largest trading power and its third biggest greenhouse gas emitter. While the combined military expenditure of the EU member states is still second only to the United States, the Union and its member states collectively provide 57 percent of global Official Development Assistance (ODA) and therefore easily outpace any other global actor. Nonetheless, despite a few success stories, the EU sails below its potential. The Global Strategy for the European Union’s Foreign and Security Policy (2016) aims to make better use of such potential. The Strategy rightly acknowledges that “prosperity must be shared and requires fulfilling the Sustainable Development Goals worldwide, including in Europe.” This was a bold statement to make just a couple of months after the adoption of the SDGs. When calling for a more collective approach and realignment of priorities so that they better suit all countries and regions, the Global Strategy even saw the SDGs as an opportunity to catalyze greater coherence between the internal and external dimensions of policies and across financial instruments. The strategic environment has changed dramatically since the adoption of the Global Strategy. The rules-based order and shared values have been increasingly questioned and can no longer be taken for granted. Against this backdrop, the first two reports on Implementing the Global Strategy placed even more importance on “closer-than-ever” cooperation with the United Nations (2017) whilst maintaining that the EU “is playing a leading role in driving forward and upholding global agreements” (2018), which includes the 2030 Agenda and the Paris Climate Agreement. This can be seen as part of a slow but steady realization that the SDGs in their entirety are of geopolitical significance. Projecting European soft power by building on the SDGs as a globally shared agenda offers huge potential for Europe’s role in the world. However, further efforts at implementation will need to be made to fully grasp the opportunity on offer across all the EU’s regional and bilateral cooperation arrangements. Implementing the 2030 Agenda only in partnership with developing countries, as rolled out in the 2017 European Consensus on Development document, entitled Our World, our Dignity, our Future, is an insufficient approach harking back to pre-2015 times and is not in line with the new and universal concept of sustainable development and the transformative ambition of the 2020 Agenda. Judged against the SDGs, all countries are developing countries. Therefore, the EU needs a new and different, truly universal concept of international cooperation for sustainable development that addresses all types of entities, rich and poor alike. Global leadership and influence are best exerted if actors shape their international strategies in a way which ensures their domestic agendas and values, their global interests, and the concepts and projects they sell to the world reinforce each other. The United States did so after World War II when it built an alliance of liberal market economies around the world. Today, China’s Belt and Road Initiative can be seen in a similar vein, linking Asia, Europe, and Africa to the Chinese development pathway. For Europe, preserving its values and prosperity in a peaceful world depends critically on achieving the SDGs, both inside its borders and globally. That is why it will be critical for the EU to review and reassess all of its foreign affairs and partnerships through the SDG lens. This would inevitably lead to the revaluation of existing partnerships, crisscrossing traditional political, economic, or military ties. In order to prioritize and design future partnerships, the EU should focus on countries and regions where transformative change is particularly necessary and mutually beneficial. So far, the Global Strategy has not yet translated the SDGs into an operationalized agenda that would inform its “cooperative regional orders” policy towards countries and regions as varied as Russia and the United States, China and Canada, ASEAN and MERCOSUR, or the EU’s neighborhood and Africa. To be up to the task, the EU needs to think big and consider a Transformational Partnerships Initiative under which it would offer transformative partnership agreements to all countries in the world, from North and South America to Africa, Asia, and the Pacific. These reciprocal agreements would provide frameworks for cooperation aimed at overcoming critical bottlenecks to achieving the SDGs. If underpinned by political leadership and the involvement of business, civil society, and academia, the Transformational Partnerships Initiative could become Europe’s geopolitical response to increasing tensions between great powers, particularly China and the United States.